Well, here we are, still in Norfolk, having watched four major storms go by in the last four weeks: the tropical storm that drove us inland of Cape Hatteras in the first place, then Hurricanes Irma, Jose, and now Maria, in their weekly procession. The Chesapeake a dream cruising destination? Maybe, but not this year. The locals say it’s the worst hurricane season they can remember for a long time. Thankfully, none have actually struck this part of the US coast, that pokes so provocatively out towards the east, but each has threatened to do so, and then turned away to the east or west at the last minute. However, we have run out of time for now. 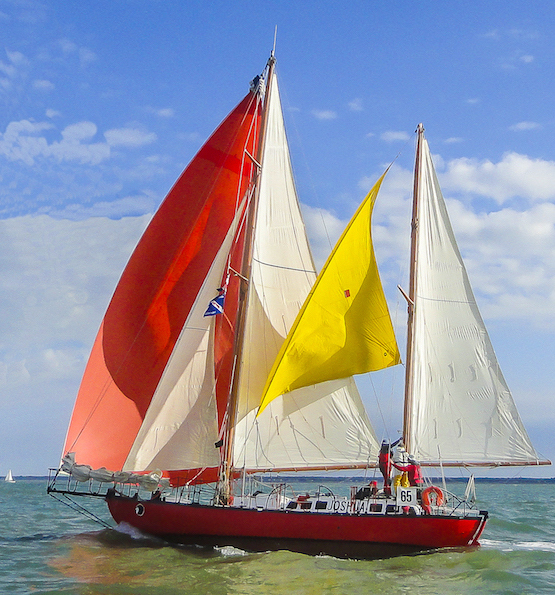 We want to have Petronella professionally painted before we head south again for the Bahamas. So, we have hauled her out again, and handed her over to Howdy Bailey -- one of the most respected steel boat builders in the mid-Atlantic region. We are having her bottom soda-blasted down to the original coal tar layer, and then repainted with many coats of an ablative paint that should get us through two or three years at least. And we are restoring her to the original Joshua colors -- Rochelle Red with black trim. 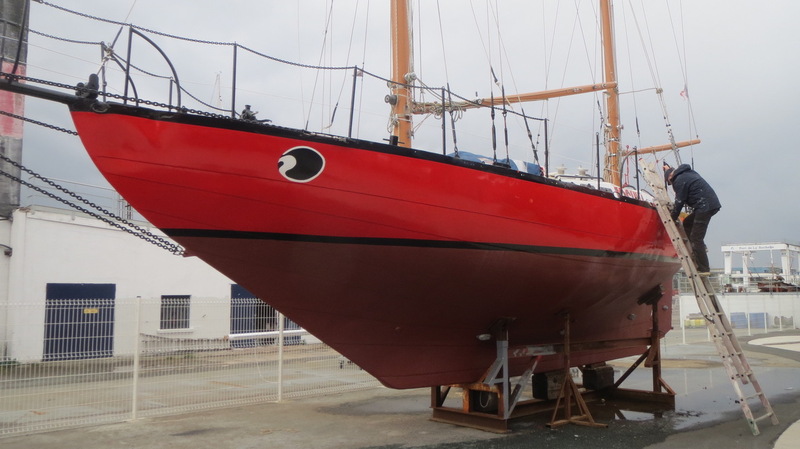 We discovered the name of the original red color by consulting with the Musee Maritime La Rochelle -- the museum in France that owns Bernard Moitessier’s Joshua. Here are some photos of the original Joshua, which will show what we are after. Unusual, oui? The original Joshua on the water... love that mizzen staysail! We are feeling a bit lost without our Petronella, but its impossible to stay on the boat while it’s being sandblasted and painted. More on our plans as soon as we make them!